It is five days short of one year since I wrote my first article about the deplorable conditions at the Ft. Rosecrans national cemetery. Over the past year, I have made numerous trips to the cemetery – my husband is interred there – and have been depressed, angry, sickened, etc. by what I have seen. Today I decided to go back and look for the improvements everyone has been talking about. Artificial turf, laid poorly. Don’t trip! Rather than just tell you about it – as I have done in the past – I have taken some pictures that will give you an idea of how our servicemen and servicewomen are being treated. I do want to say that there were men working on the sprinkler system to the south of the entrance; in fact the entryway was blocked off and one of the men moved the cones so I could drive down to the gravesite. Interestingly enough, they were working to “green the grass” just behind where the artificial turf had been laid. (Poorly, I might add.) Is that so the mind thinks “green” when driving in? 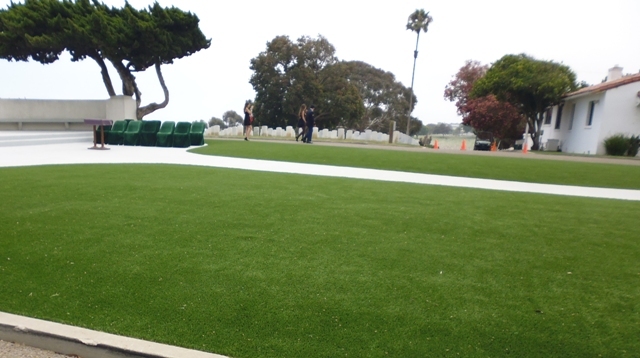 The artificial grass is laughable, if one feels like laughing at the cemetery. Look at the picture of the huge ripple in it and tell me that no one is going to trip on it someday. Seems to me that whomever is paying for it (us – the taxpayer?) was sold a bill of goods. If it were laid like that in my backyard I’d have it torn up immediately. And one more thing – why isn’t anyone working on Saturday or/and Sunday to get this cemetery back into shape? One year should be long enough to disrespect our fallen hero’s. Doesn’t the artificial turf look nicey-nice? Makes you forget what else is going on. Acres of grass is not my idea of a memorial park in a desert. Xeriscape it and forget about lawn order. We can’t afford it these days. Wasting precious resources is not a good way to show respect to the fallen. I also have friends buried there. Pretty sure they’d prefer sagebrush to bluegrass. You are right – San Diego is a desert. However, with reclaimed water there should not be a problem in keeping the cemetery green. Look at Arlington with the 4 seasons. I do not think my husband would appreciate sagebrush and I know he would not want artificial turf. Besides it being a resting place for him, it is a place I go to for solace and comfort. Haven’t found it there for a year. Terrible. And didn’t they say the place would be just perfect by this date? On TV? It looks like this project is being stunningly mismanaged. They did say “August”. Unfortunately, they didn’t say what year! Judi, good point. Look how they treat the living veterans. One to two years after you get your paperwork perfect. If you are suicidal the VA will definitely help – push you over the edge! Judi, This is really sad & upsetting. Thank you for keeping on top of it. I hope & pray that the next time you & I go there to visit our husbands Jeff’s & Bob’s niches that we see some improvement. I am sorry that you will not find solace there near your husband’s niche until at least the end of the year. I’m not sure what you are looking at, though, when you assert virtually no progress. I drive by there every day going to and from work. Did you look at the West (ocean) side or the southern end of the East side where the re-alignment has been completed and the irrigation replaced, and notice the difference? The sections dug up right now (the northern third or so of the bay side) are not the sections that were dug up 6 months ago (the extreme southern (and northern) ends of the east side), or last year (the west side). [I believe that a few rows along the northern edge of the east wall have been in process for longer than other sections; I have no idea what the holdup is, but work continues elsewhere.] 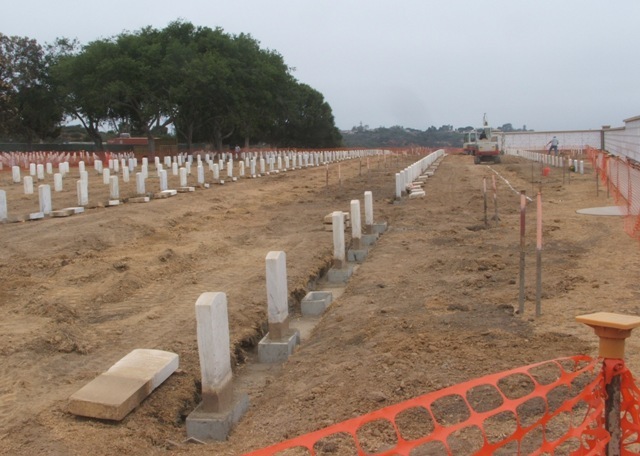 Sections are completed, other sections are under way, and the large central area on the bay side south of the shelter is still untouched, so you can see how out of alignment the headstones have shifted & tilted. If you look at that area, then compare it to the southern end, you will understand what they are doing to bring the cemetery up to national memorial standards. The process is that the workers carefully(!) remove every other row of headstones, and lay them in order at the base of the retained rows, not stacked or disrespectfully scattered about. Then they dig a trench, place those heavy concrete bases you can see in your top photo, somehow level and stabilize the bases (I’ve never seen them doing that when I drive by), then use 2 metal poles on each base to shift and align them down the rows and on the diagonals (spacing along rows). Then they clean and replace the headstones, and finish backfilling. The process is repeated on the alternate rows, then early one morning they have several flatbed semis deliver sod, and they resod the entire section. Presumably they replace the irrigation pipes before the sodding, but again, that happens toward the middle of the day when I’m working, and isn’t as obvious to see driving by in the evening. Last spring I read that the project won’t be completed until the end of the year, I never heard August but I’ll take your word for it that someone said that on local TV news. The solicitation for phase 6 appears to have closed the end of January, so the contractor probably has until March 2014 or so to complete the work in 365 days since award (but gets their payment sooner by finishing sooner). 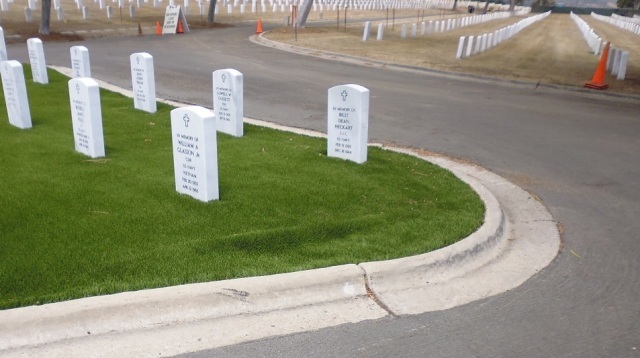 From my observations, the astroturf is a make-do solution to interring someone in or near an in-process area (although the solicitation lists 700 sq ft of it, I think that goes where non-graveside services are held). There’s also a much smaller piece that appears to be used around the burial site for graveside services so that the visitors do not trample the sod on the nearby graves, or get muddy sod on their dress shoes. 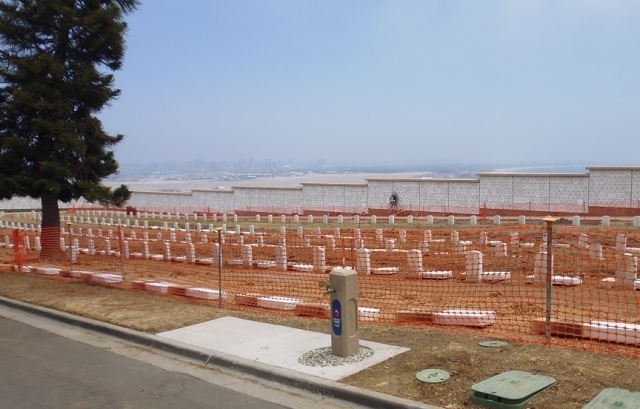 As for reclaimed water, enough people think that using reclaimed water to irrigate cemeteries is disrespectful that I’m pretty sure the VA does not use it at Fort Rosecrans. 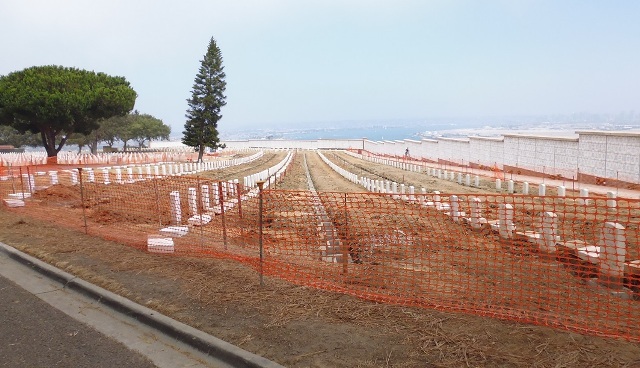 Perhaps you could contact the new VA administrator for Fort Rosecrans, and have him or her give you a better overview of what is happening, why it is happening, and when it will be completed? If I was in charge (or even just worked there), I certainly would have made sure that there were sufficient signs explaining the work to visitors, as relatives and visitors are the primary customers as well as political support for the cemetery. I’m a map guy, so I’d have a simple map on the website with sections color coded for status and completion dates in the refurbishment project, so visitors could see the status of their loved one’s section before making the trip. Again, I hope that you will be able to find peace and solace when visiting there again soon: the end of the Point is beautiful in sun or fog. If you want, I can post a comment here in a few months when those north east sections are completed (I assume that’s where you husband is). Thank you Tom for your enlightening answer. I hope that you are right re: the end of the year. However, it is a fools folly to try and “repair” the entire cemetery at one time. There is no question in my mind that prior to my first article in August that the Northeast side of the cemetery was being neglected. They should have waited until they finished one side before starting the other side. I do not go to the Ocean side of the cemetery. Why would I? my husband is not on that side. I cannot compare one side of the cemetery to the other. How do I know that “my” side will be completed? Do you know how long it has been since I could get to the wall and pay my respects to my husband? I was told August, 2013, by a previous director. I didn’t hear it on the news. As far as the workers – my English is pretty good; my Spanish a little rusty, but when I communicated with the workers just last month, I had to speak Spanish, not English, and I would bet that the two men I spoke to were not veterans. Your idea of posting a map saying what is going on is a good one. It’s a little late for it, because it should have been done months ago. I appreciate your offer to post a comment in a few months. As I live in the area and go to “visit” every month, between us we can let the public know just what is happening there. Thank you Judi for the update, and I will be most interested in hearing the outcome of your meeting on the 29th. I have stopped going out there, as it is too depressing. I use to use it as a point of sanctuary, to visit several relatives there, to sit and reflect. I can’t stand to do that with the deplorable conditions of brown grass and the last time stench of some type of water being used to water the grass on the ocean side (who would want to go there with that smell?!). The other sad point of all the brown grass, as an avid birder the cemetery was a joy to go to, to record migrating bird species and catch the occasional rare bird. The last 2 times I saw maybe a black phoebe or two, certainly not the flocks of various species who combed the grasses for bugs – they aren’t there now, so neither are the birds. All so sad.